A Carstairs Village boy believed to be Scotland’s youngest qualified football coach is all set to launch a business of his own to teach youngsters aged four to 13, writes Craig Goldthorp. Lanark Grammar School pupil Kieran Steele (16), who already has his Level 1 to Level 3 coaching badges, will stage his first one-hour Saturday morning session at Lanark Racecourse next month, date to be confirmed. “I really enjoy doing the coaching,” Kieran told the Carluke and Lanark Gazette. “I must be one of the youngest guys in Scotland to have the coaching badges, which I did at Hamilton Palace Sports Grounds. 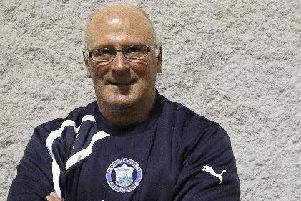 “If I am the youngest qualified coach in Scotland then that is amazing. “You are not supposed to have all these badges at such a young age, but – because I have done so much voluntary coaching in the past – Colin McKendrick of South Lanarkshire Leisure and Culture put me through my badges at 15. “I am really excited that my coaching business is all set to start next month. “I can’t wait, it will be great. Kieran’s coaching exploits were recognised recently when he was named as Volunteer Role Model term one winner in a recent South Lanarkshire Council Active Schools competition. This was a richly deserved award for a teenager who has consistently taught football skills over the years since first getting advice from Roar Active coach Teresa O’Keeffe when he himself was a young player. 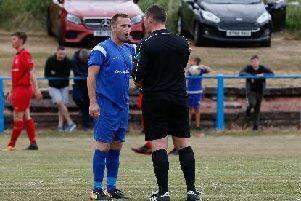 Kieran played football between the ages of six and 13, turning out for Lanark Thistle, Lanark United and Kirkfield United before this latter team folded in 2016. Kieran’s fledgling coaching efforts had already begun by the time he volunteered to coach the 2003 Kirkfield team to keep it going, but the offer was declined as no-one else could be found to share coaching duties. He now coaches five days a week with Roar Active, a company he started working for in October 2014. And Kieran also works as a coach for South Lanarkshire Council’s Active Schools programme. He also somehow manages to squeeze in his school subjects, National 5 Maths, English and Sports Leadership, plus Higher PE. “I hope to be a coach for many years to come,” Kieran added. Kieran is currently looking forward to starting a Coaching and Development Level 6 course at City of Glasgow College this August. He is fully insured to run his own upcoming courses for four to 13-year-olds at Lanark Racecourse, which cost £20 for a casual booking or £175 for a block of 10. For more information, call Kieran on 07728 753579.